Chennai is the capital of the indian state of Tamil Nadu. It's the seventh largest city in India to incorporate a subway system. Chennai is a 7.5 million inhabitants city that has grown rapidly generating large concentrations, congestions and complicated street traffic. So there really was a need for an urban rail system and the Government of Tamil Nadu planned to build the Chennai Metro Rail Project. The Chennai Metro Rail service is integrated with buses and suburban trains. 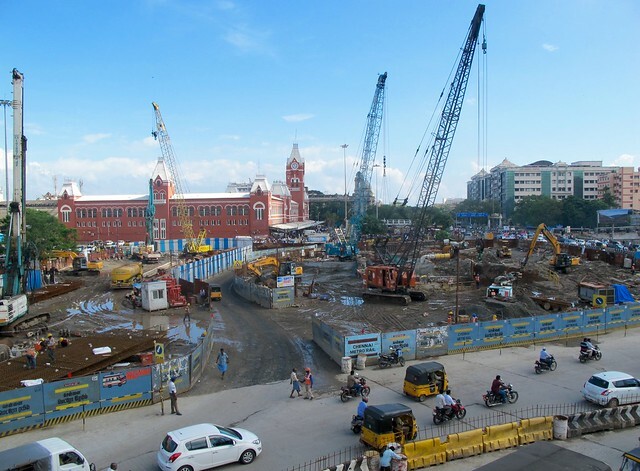 The project was awarded for its implementation and operation to the Chennai Metro Rail Corporation Limited (CMRC). The first section of the Chennai metro project started operating on June 29, 2015. The beginning of the project dates back to 2005 when the local government began to consider its construction. Designed for over a decade, on a budget of 14,000 million rupees suffered several bureaucratic slowness and several deadlines until finally was inaugurated. The Corridor I, also known as Blue Line, covers from Washermanpet to Chennai International Airport in 23.1 kms of tracks. It has 10 underground stations: Washermenpet, Mannadi, High Court, Chennai Central Station, Government Estate, LIC, Thousand Lights, AG-DMS, Teynampet, Nandanam, Saidapet. Also 6 elevated stations: Little Mount, Guindy, Alandur, OTA, Meenambakiam, Chennai Airport. The line starts in Chennai Central and goes to St Thomas Mount covering 22 kms and 17 stations of which 9 are underground and 8 are elevated. Underground stations: Central Chennai, Egmore, Kipauk, Nehru Park, Pachaiyappa's, Shenoy Nagar, Annanagar East, Anna Nagar Tower, Tirumangalam, Koyambedu. Elevated stations: CMBT, Arumbakkam, Vadapalani, Ashok Nagar, Ekkattuthangal, Alandur, St. Thomas Mount. Corridor-3: Ambathur Industrial Area (Mogapair), Ring Road, Arcort road, Panagal Park, Theagaraya road, Eldams road, Luz Church Road, RK Mutt Road, Adyar Bridge, Lattice Bridge Road, Tiruvanmiyur. Corridor-4: Porur - Kodambakkam (Arcort Road), Panagal Park, Theagaraya road, Eldams Road, Luz Church Road, Kutchery Road, Kamrajair Salai. Corridor-7 along the road 5 NH. Frequency in peak hours is 10 minutes. Rest of the hours is 15 minutes including weekends. Since opening the Chennai Metro adopted fixed rates according to the distance traveled. So the minimum cost is ₹ 10 and the maximum can be up to ₹ 40. This makes it the most expensive from all over India, including the capital New Delhi. There are two forms of payment, smart cards and tokens. You can buy them at every station. Remember to drop the token at the gates which will automatically open the exit doors. To get one Store Value card you need to pay a refundable deposit for the card. The deposit is Rs.50 and also you will have to recharge a minimum of Rs.50. Then the minumum recharges are Rs.100. Maximum top-up is 3000 rupees. Your credit will expire after a year after the last recharge. By using the store value card you will get a 10% discount on fares in every journey. Another benefit is that you wont need to stand in queues for tickets. The card is tranferable and can be bought and recharged from automatic vending machines at the stations. It's ideal for visitors for a limited period. It cost a fare of Rs.100 plus a Rs.50 Refundable deposit. Special features are unlimited rides, valid for one day only. Can be purchased on all days. Card to be used within 30 days from the date of purchase. Can be buyed and recharged from the automatic expending machines at the stations. It's for citizens and other residents who use the metro daily. You must select two fixed stations, origin and destination. 60 trips valid for 60 days - between 480 and 1920 rupees. You can obtain a discount of 20% from normal fares. You have to leave a 50 rupees deposit on surrender of the card. Trip cards can be bought and recharged from the automatic vending machines at the stations. Among the penalties there one month in prison and a fine of 50 rupees to anyone trying to ride on the roof of the train.